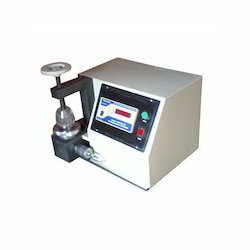 We are an incredible entity, instrumental in offering superior quality Digital Bursting Strength Tester. Appropriate for testing the bursting strength of leather, fabric, paper, and paperboard, this fabric testing instrument is manufactured by our expert professionals in tune with the set quality standards. Recognized for enduring performance, compact design, corrosion resistance, less maintenance and longer service life, this tester is broadly accepted in the market. To meet the different needs of patrons, this product is offered in diverse technical specifications at highly economical prices. Looking for Digital Bursting Strength Tester ?